Stews | What's in a name? The decluttering of home and computer is still grinding on here in Albany, interrupted only by a visit to you last weekend and the inevitable follow-up head cold (damn you, day care). Luckily, not snot, nor sleet, nor driving rain could keep us from enjoying ourselves while your Mum and Dad went off to your Aunty Justine’s wedding last Saturday. Give a Nanna and her granddaughter a whole house to themselves and before long they’ll have pretend zoos, pretend shops, pretend parks and pretend “work” coming out of their earholes. Anyway, when I got home – sad, lonely and bereft at no longer being with you but strangely relieved to regain a life that didn’t involve jumping or hopping – I found something on my computer that I’d totally forgotten about. It was like striking gold. Back in my Early Nigella Period, I’d often visit Nigella.com and look at the forum, which was called Your Page. It was heaven on a stick – dominated by a bunch of Nigella groupies who thought of themselves as forum royalty because they’d been there from the very start, and who maintained such an amazing mix of full-on fawning, saccharine sweetness and cold-blooded bitchiness, it made your eyes water. Nanna loved the goings on in the forum. It made her snort her cup of tea over the computer screen on more than one occasion. Sadly, Nigella closed it down. But not before Nanna copied and pasted the following gem, which was only up for a short time before a moderator trashed it. It was posted by someone called Hiya on September 4, 2007, the day after the first episode of Nigella Express aired in the UK on BBC TV. This was the episode in which Nigella referred to squid as “squiddies” (I know – gag). “(I) sent (this) to the BBC too. I don’t expect a response, who would after watching that unctuous, toe-curling, self-promoting (paid for by the TV licence) exhibition of pathetic pouting and mealy-mouthed rubbish. “‘Squiddies’ for God’s sake. This was enough to reach for the flight bag if I had one at home, but the surrounding nauseous nonsense of the programme was insulting as well. I’m not skint but the sight of Lordette Lawson making beds that colour-coordinated with the wallpaper, well! !, busy mobile texting to cares who in the black cab having exited the mews home!! “I hope we did not pay for the kitchen as well – in fact, don’t tell me, I’d rather not know. Lord and Lordette Lawson and the kids eating chicken and spuds and peas – how dare you give this airtime? Call me shallow but when it comes to memorable writing I reckon you can’t beat a good rant. 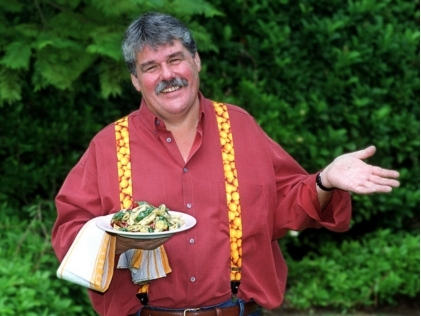 Not that it’s got anything to do with today’s recipe, which comes from Aussie TV chef Iain “Huey” Hewitson and is a real corker. I’ve made Braised East-West Oxtail twice now, the latest being last night because the weather’s still cold enough down here to warrant winter food. Don’t be tempted to leave out the grated orange rind – it gives the dish a beautiful flavour. 1. Wrap the de-rinded orange tightly in plastic wrap and put it in the fridge while you spend three hours looking for a recipe that uses the juice of just one orange. 2. Forget the orange is in the fridge until three weeks later. 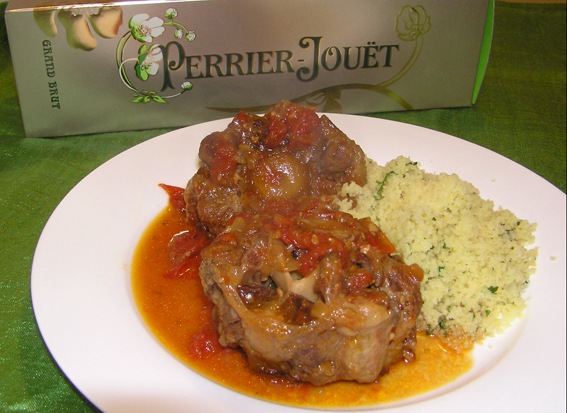 You’ll notice that a box that once contained a bottle of Perrier-Jouet Grand Brut champagne is reclining nonchalantly behind the plate of oxtail and couscous in the photo accompanying the recipe. That’s because we’d knocked off the contents earlier in the evening to celebrate winning a work contract that we’re very pleased about. 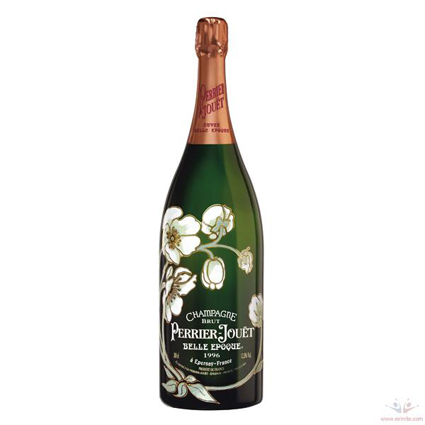 Your Grandpa had to ask himself at the bottle shop if we were pleased enough to buy a bottle of Perrier-Jouet Belle Epoque, which we love, love, love and which looks like this. Unfortunately the Belle Epoque costs $220 per hand-painted bottle, so there’s your answer. Your Grandpa decided to wait and buy a crate of it when we win the $100 million Lotto draw on Tuesday night. This is my version of a recipe by Iain Hewitson, who in turn was inspired by American-Chinese chef, Ken Hom. You’ll find Huey’s original recipe here. If you don’t want to cook this on top of the stove, preheat the oven to 160C. Trim the excess fat from the oxtail pieces. Bring a big heavy-based pot of water to the boil, add the oxtail pieces and simmer them for 15 minutes (a lot of scum will rise to the surface – just ignore it). Fish the oxtail pieces out with tongs, drain them well in a colander and clean the heavy-based pot you’ve just cooked them in. Put the pot over medium-high heat with a thin layer of oil in the bottom and brown the oxtail pieces all over. Remove them to a plate covered with kitchen paper so the fat can drain off. Lower the heat under the pot and gently sauté the onions and shallots until they start to soften, about 5 minutes. Add the garlic and cook, stirring, for another couple of minutes. Add all the remaining ingredients, stirring well, and bring to the boil. Add the oxtail to the pot (in one layer if possible) then turn the heat down to very low, cover the pot tightly and simmer for 3 to 3½ hours (or put it in the oven for the same amount of time). It’s ready when the meat pulls easily away from the bone. Serve with couscous, rice or mashed potatoes. It occurred to me today that even though I’m 710 months old, I’m not really smart enough to work a smartphone. I often press send instead of delete so that people get text messages like “How about we p” or “Yes! He cra”. 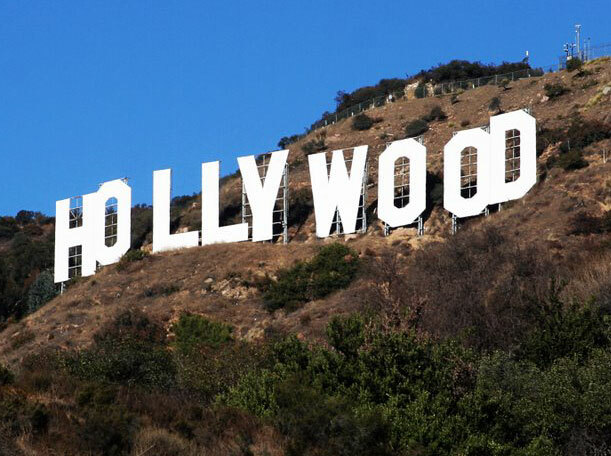 A lot of this is because I sometimes can’t find my glasses and basically I need to wear them for anything with letters smaller than the Hollywood sign. You, on the other hand, are a smartphone kinda gal. 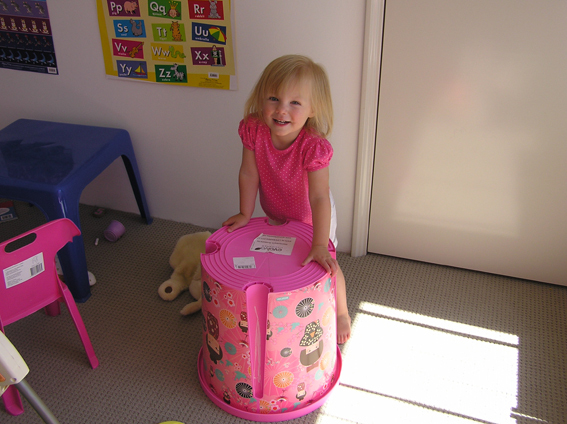 At just 19 months old, you managed to send a text message to a Channel 7 news reporter without even looking at the phone. The fact that he didn’t know what the hell you were on about is neither here nor there. It’s definitely an achievement worth noting, even though it embarrassed your mother. 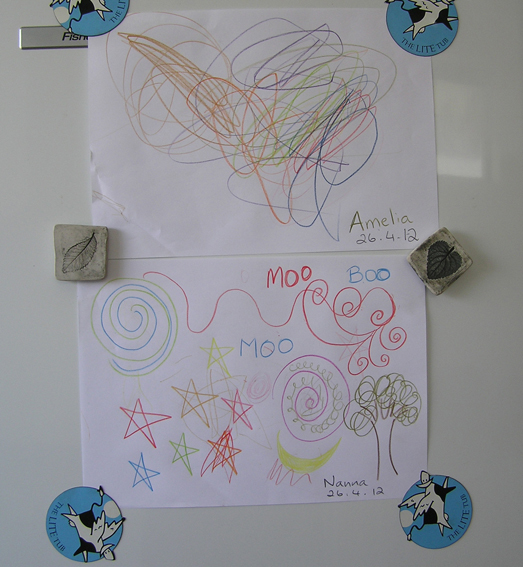 Luckily, Nanna is far better at drawing than you are, otherwise her self-esteem would be in the toilet. Speaking of toilets, mine is very clean at the moment because we had friends over for dinner last night. Your Grandpa tells people that I only have friends over for dinner so I’m forced to clean the house. Housework has never been my forte. My talents definitely lie elsewhere, as did those of the late Nancy Mitford, a member of a very eccentric, upper-crust English family and one of my favourite authors. Nancy was so useless at matters domestic, she didn’t even know how to thread a needle. Her maid used to thread several of them before she went on holiday in case a button dropped off one of Nancy’s frocks and Nancy was forced to re-attach it herself. All I can say is, I wish I had a maid. But I haven’t and so yesterday I cleaned the house and cooked enough Oxtail Stew to feed Albany and its immediate surrounds. Don’t be put off by the fact that you are eating the tail of a cow. Oxtail Stew is one of the most delicious things on Earth and even if you never cook anything else in your life, you must cook this. It doesn’t photograph well because it’s just sort of glossy and brown. So, instead, I’ve posted a picture of the way the kitchen bench looked when I cooked it (yes, Nanna is a messy cook). 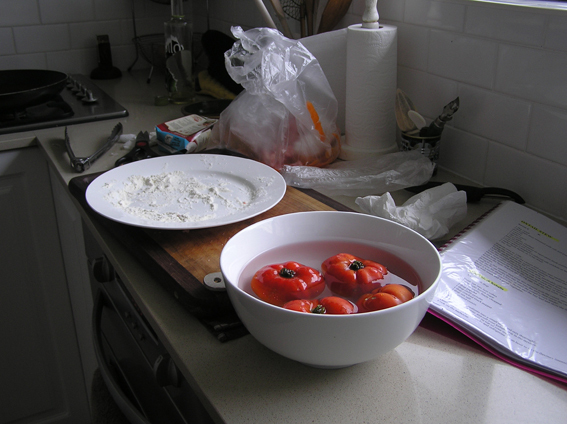 Also, in case you’re wondering, those tomatoes are in a bowl of water because they’re frozen, home-grown ones. One more thing: My local Woolies doesn’t call it oxtail any more – the label on the pack says beef tail. As far as I can tell there’s no reason for this change other than to give me the shits. Chop the onion. Cut the carrots and celery into medium dice. Heat some olive oil in a big frying pan and sauté the veges over medium heat until the onion is soft (about 5 minutes). Add the garlic and sauté for a minute more. Tip this mixture into a big casserole dish, preferably cast iron. Trim the oxtail of excess fat and dust with seasoned flour. Heat more olive oil in the frying pan and cook the oxtail over medium-high heat, removing them to the casserole dish once they’re browned all over. Reduce the heat a little, pour the red wine and stock into the frying pan and then stir in the peeled, diced tomatoes. Bring to a fast simmer then pour this mixture over the oxtail, stirring to combine. Push the thyme stalks and bay leaf into the stew, then cover the casserole dish and cook in the oven for 3½ hours, or until the oxtail is very tender. Remove the thyme stalks and bay leaf, skim off any excess fat and serve with mashed potatoes and a green vegetable.